With a history of several hundred years, Yimeng produces a wide variety of snacks, many of which are related to moving historical legends. Well prepared with different materials and ingredients, they are warmly received by customers. With a time-honored history, thin pancakes made of millet flour are very popular in the Yimeng Mountain areas. Six-sister thin pancakes are prepared with unique materials and techniques with various colors. Beautifully shaped, this cake is crunchy, crisp, aromatic, sweet and nutritious, suitable for the elderly and young. Important Arts for the People's Welfare written by Jia Sixie of the Northern Wei Dynasty (386-534) records the way to produce fermented soy beans. 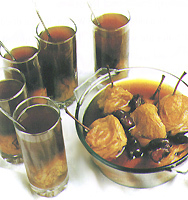 The techniques for producing Linyi eight-treasure fermented soy beans first appeared in the Daoguang reign period of the Qing Dynasty. The manager of "Weiyizhai" Sauce and Pickle Shop gathered various techniques to produce its own fermented soy beans, which are nutritious, bright in color and richly fragrant. Prepared with a secret prescription handed down in the family from generation to generation, Wang's cooked pears have a unique taste, soft, mellow, sweet and richly fragrant. Such pears can help get rid of heat, moisten the lung, stop coughing, and nourish the liver and heart.